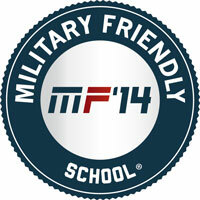 Huntington University has been named to the 2014 Military Friendly Schools list for the second year in a row. The list honors the top 20 percent of colleges, universities and trade schools in the country that are doing the most to embrace America’s military service members, veterans and spouses as students and ensure their success on campus. The list comes from Victory Media, an organization for military personnel transitioning into civilian life. The 1,868 schools on this year’s list exhibit leading practices in the recruitment and retention of students with military experience. Now in its fifth year, the list is compiled through extensive research and a data-driven survey of more than 10,000 schools nationwide approved for VA tuition funding. HU’s adult programs lowered the cost of degree programs $250 per credit hour for all 100 and 200-level courses for active-duty military personnel and their dependents. 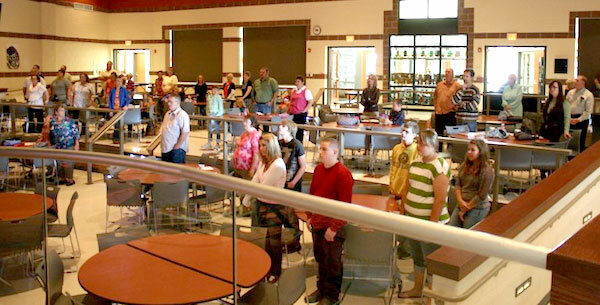 Mill Chapel (Reedsville, W. Va.) celebrated its 40th year anniversary October 19-20. It was a two-day celebration. Saturdays attendance was 150 and Sundays was 230. It was our first Homecoming. Dr. Paul Michelson (right), professor of History at Huntington University, with the new Alpha Chi inductees. Two United Brethren students were among the 20 Huntington University students inducted into the Indiana Beta Chapter of Alpha Chi during a convocation held Oct. 16. Emily Carbaugh, from Salem UB church (Chambersburg, Pa.). Bronwen Fetters, from College Park Church (Huntington, Ind.). Membership in Alpha Chi is the highest academic honor at Huntington University. It recognizes scholastic achievement, a commitment to promoting academic excellence and integrity on and off campus, and service. The three North Americans with the Nicaraguans who participated in five days of small business training. Nicaraguan participants in the training. Victor Mojica leading a training session in Nicaragua. The rapid multiplication of disciples who make disciples. Church structures that are adapted to the environment. Pastors and church planters who are developing small businesses. Many look at the use of small business as a way for pastors and church planters to simply support themselves. But there are many other advantages. Acts 18:1-4 gives the example of Paul and coworkers Aquila and Priscilla, who supported themselves as tentmakers. In this way, they gained access to people in the Corinthian marketplace among whom they could evangelize and make disciples. Their example and integrity earned the respect of outsiders and believers. Global Ministries has been providing training for pastors and church planters who want to use small business to transform their communities for Christ. Last week, three of us from the United States spent five days in Nicaragua. I was joined by Jeff Dice (non-traditional Global Ministries staff member) and Victor Mojica, a Hispanic pastor who leads the Clearview UB church in Goshen, Ind. 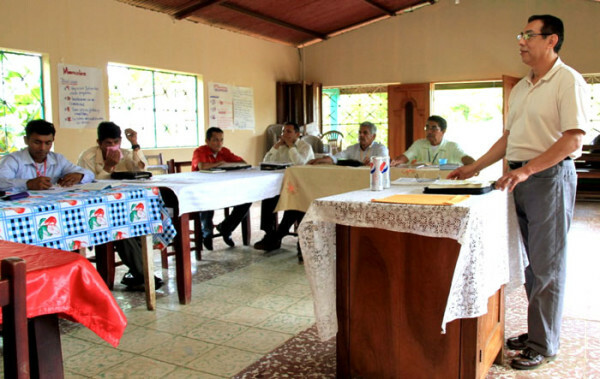 We conducted five days of small business training with 11 pastors and church planters in Nicaragua. The small business training provided everything they would need to know to effectively start and manage a small business, but also focused on how to use the business to expand their ministry. It’s what is known as the dual bottom line – successful business and successful ministry. The training this past week was the second such effort. The first was conducted in Sierra Leone. 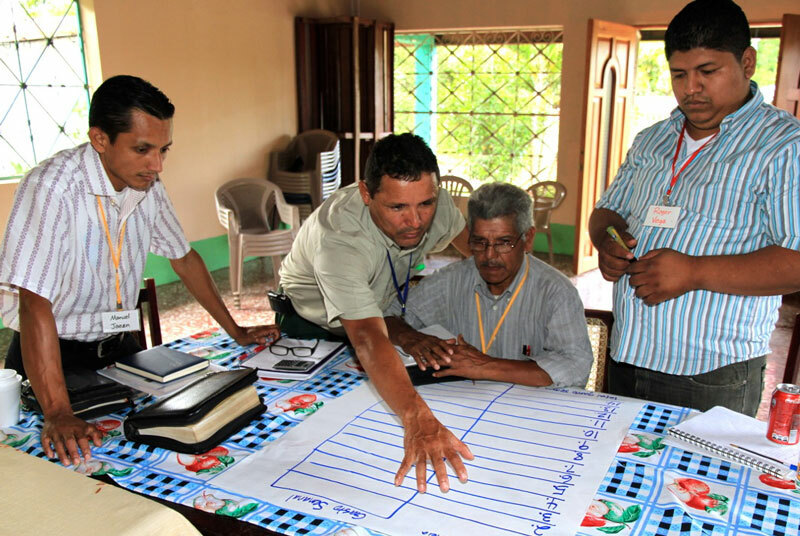 Global Ministries hopes to continue offering similar training events in Central America, Africa, India, and Asia. If you’re a small business owner and would be interested in knowing more about serving as a trainer, contact Jeff Bleijerveld in Global Ministries. 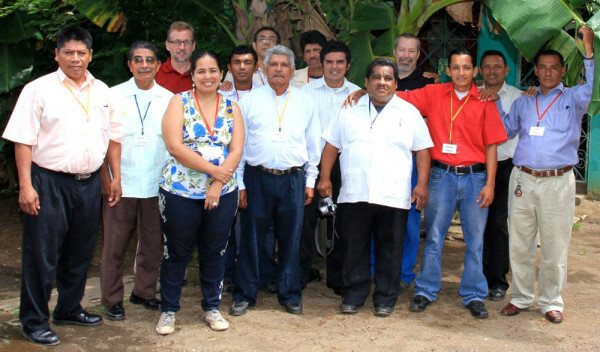 Gary Brooks, a former United Brethren pastor and missionary in Honduras, recently returned from Mexico, where he helped Bishop Denis Casco conduct a leadership training seminar for members of our churches in Mexico. Gary, who currently lives in Florida, has participated in a number of training events for Mexico Conference. Here is Gary’s report about last week’s event. Twenty adults participated in the seminar that was held in Dr. Mora, Guanajuato. This is a rural area about an hour or so out of Queretaro. I taught about the dangers of carnal leadership. The focus of this mini-series of lessons was King Saul. Our study included most of 1 Samuel. Bishop Denis Casco taught a series of lessons from Nehemiah. His interest in God’s people. His personal involvement in their lives. His intercession on their behalf. We closed out the seminar by setting aside a brother for the gospel ministry. The following day, we drove to Celaya to visit an elderly man and his daughter. Denis shared the Gospel with them, and they both readily made professions of faith. Saturday evening, we boarded a bus and returned to Mexico City. Sunday was a day of relaxation. As is our custom, we strolled along the Paseo de La Reforma. We saw a colorful parade, line dancing, and a “professional” Mexican wrestling match, and even got a free hug that I’ll never be able to explain to my loving wife. These seminars are valuable opportunities to provide continuing education for lay church workers and pastors in the churches of the United Brethren in Christ scattered throughout this beautiful country south of our border. This is just one of three outreaches led by Bishop Denis Casco in Mexico. Another is the Vacation Bible School that reaches out to children. The third is the moral and spiritual support our Mexican brethren receive from periodic visits made by Brother Denis. If people would like to contribute to the leadership development needs of Mexico Conference, they can do so by sending a gift marked specifically for Mexican Leadership Development. Top row (l-r). The four out-going members: Lee Rhodes, Dennis Sites, David Burkett, Chuck Wheatley. Continuing members: Phil Whipple, Chris Little, Terry Smith. Bottom row. Continuing members: Bob Bruce, Craig Burkholder. New members: Gary Gates, Mark Wilson, Randy Carpenter, Jim Bolich, Mike Brown. The Pastoral Ministry Leadership Team is meeting today and tomorrow (October 21-22) in Huntington, Ind. The PMLT deals with various issues involving ministers, in particular licensing and education. The PMLT consists of ten ordained UB ministers. They include the bishop, the chairman, and up to eight persons appointed to two-year terms by the Executive Leadership Team. Five changes have occurred on the Pastoral Ministry Leadership Team for the 2013-2015 period. Lee Rhodes, who has chaired the team since 2005. He is pastor of Countryside UB church (Breckinridge, Mich.). Denny Sites, pastor of Jerusalem Chapel UB church (Churchville, Va.). Denny is now a member of the Executive Leadership Team. David Burkett, senior pastor of Mount Morris UB church (Mount Morris, Mich.). Chuck Wheatley, senior pastor of Avlon UB church (Bremen, Ohio). Chuck retired this year. Mark Wilson, senior pastor of Fowlerville UB church (Fowlerville, Mich.). Randy Carpenter, senior pastor of Sunfield UB church (Sunfield, Mich.). Jim Bolich, senior pastor of Prince Street UB church (Shippensburg, Pa.). Mike Brown, senior pastor of Franklin UB church (New Albany, Ohio). You can see the complete team here. Bridge Fellowship has been meeting at the North Baltimore High School. 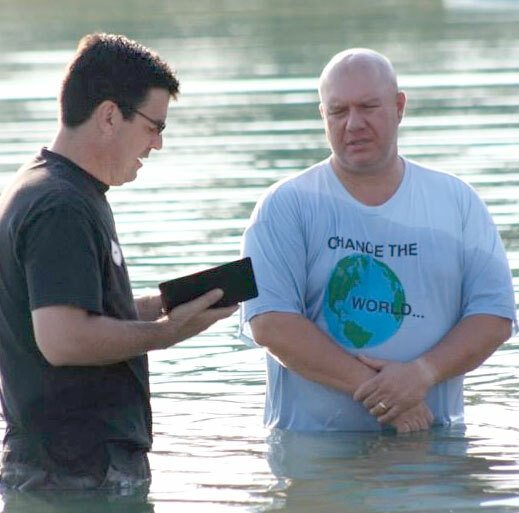 Bridge Fellowship held its first baptismal service in August. Pastor Mike Soltis is on the left. Bridge Fellowship, a church plant in North Baltimore, Ohio, will officially launch on Sunday, October 20. The core group has been meeting for some time, using the North Baltimore High School. Now they are going public. Please keep Bridge Fellowship in your prayers this Sunday as they make this important transition. There are two new additions to the Global Ministries Leadership Team. Ruth Ralph (right), whose husband, Mark, is pastor of the Mount Zion UB church in Wayne, Ohio. Mark Wallace (left), executive director of Christian Horizons Global. He is a licensed UB minister in Canada, and is a member of the Mill Crossing UB church in Cambridge, Ontario. They took the place of former members Chuck Malson and Jeff Sherlock. The GMLT held its fall meeting at the beginning of October at the Gull Lake conference center in Michigan. The Higher Education Leadership Team is meeting tonight, October 16, as they always do prior to meetings of the Huntington University Board of Trustees. The HELT deals almost exclusively with issues pertaining to Huntington University. The members serve four-year terms. All eight members of the HELT are also members of the HU Board of Trustees, which meets October 17-18. We have one change to report. Brooks Fetters (right), a UB ordained minister who is currently mayor of Huntington, Ind., has been appointed to the team. He replaces Keith Schall, a layperson from Emmanuel Community Church (Fort Wayne, Ind.). In March 2013, Dr. Douglas Birdsall (right) became president of the American Bible Society. Doug, a licensed United Brethren minister, grew up in a UB pastor’s home, the son of Dr. Roger and MaryLou Birdsall. Prior to assuming the ABS leadership, Doug was president of the Lausanne Movement. But just a few weeks short of Doug’s official inauguration as ABS president, scheduled for November 8, he and the ABS have parted ways. Both Doug Birdsall and the American Bible Society issues statements, both of which are published on the Christianity Today website. 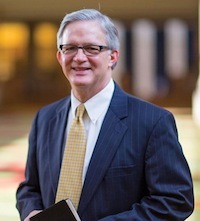 In May 2013, Wheaton College recognized Birdsall as “Alumnus of the Year for Distinguished Service to Society.” He graduated from Wheaton in 1975. He holds a Master of Divinity degree from Gordon-Conwell Theological Seminary and a Master of Theology degree from Harvard University, and recently completed his doctorate from the Oxford Centre for Mission Studies on Oxford, England. Beginning in 1979, the Birdsalls served 20 years as missionaries in Japan with what is now called Asian Access. He became the organization’s president in 1985 and leds its expansion throughout Asia (now into 12 countries). He took a position with Gordon-Conwell Theological Seminary in 1999, but continued as president of Asian Access until 2007. In 2004 he was named head of the Lausanne Committee for World Evangelization (now simply Lausanne Movement). He stepped down as leader of Asian Access in 2007. Doug and Jeanie have three children, all born in Japan. Stacia is a graduate of Princeton, Yale, and Columbia, and now works as a midwife in Manhattan. Judd worked at the US State Department and is now pursuing a doctorate at Cambridge University. Jessamin graduated from Harvard and now serves in London with Save the Children.